17 May 2018–Can altering the amount or rate of fluid injection and production in an oil and gas field or carbon storage site affect induced earthquakes in that field? A physics-based simulation presented at the 2018 SSA Annual Meeting suggests that this type of “active pressure management” can be useful in controlling induced seismicity at certain wells. The experiments conducted by Lawrence Livermore National Laboratory researcher Kayla Kroll and her colleagues were prompted by a recent spike in induced earthquake activity related to oil and gas production in the U.S. and Canada. The rise in induced earthquakes has some scientists proposing changes in injection or production processes to reduce the fluid pressures that destabilize faults in these regions. In their simulations, Kroll and colleagues “found that active management was most advantageous for wells that were closest to a fault. This scenario is most successful at reducing the total number of seismic events and also the maximum magnitude of those events,” Kroll said. In their simulations, a “close well” was one to four meters away from a fault. The researchers also noted fewer seismic events of lower magnitude when they reduced fluid injection rates over a constant period of time, compared to injections at a higher constant rate. Kroll and her colleagues used a 3-D computer simulator called RSQSim to create a catalog of earthquakes that might occur due to carbon dioxide injection into a saline reservoir adjacent to a fault. Through the simulator, they experimented with different injection and production scenarios of producing various fractions of the total injection volume from wells at different distances from the fault. The researchers do not have any site-specific pressure recommendations for well managers yet, said Kroll. 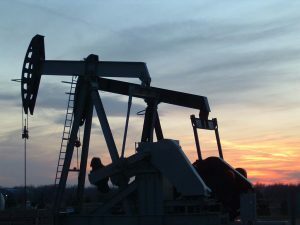 She noted that scientists would need much more data on local geology, the flow parameters of fluid reservoirs, and data from dense seismic and pressure monitoring networks to create useful active management guidelines for a particular oil or carbon storage field.